The large, 12,806-ton Melbourne Star was a twin-engined armed merchant ship capable of carrying passengers. Some of her cargo holds were also refrigerated. Built in Cammell, Laird and Company in Birkenhead, England, near Liverpool, in 1936 she is one of the few ships covered in this study with two propellers run by Sulzer diesel engines instead of steam. Her dimensions were 165.2 meters long by 21.34 meters wide and 9.75 meters deep. The owners were the Union Cold Storage Company and her managers were the famous Blue Star Line Limited of London. On her final voyage from Liverpool to Sydney, Australia via the Greenock Scotland and Panama Canal, the Melbourne Star was under the command of Captain James Bennett Hall. On board were 76 crew plus 11 Royal Navy gunners and 31 passengers, for a total of 119 souls onboard. The passengers included four French naval officers, several Australian military officers, twelve women and two children. Sadly none of them – or the Naval Gunners – were slated to survive. The Star left Liverpool on 22 March 1943 and Greenock, on the River Clyde, downstream from Glasgow, on the 24th. The ship was no stranger to wartime dangers, having been bombed by German aircraft off Ireland in 1940 and survived two resupply missions to the besieged Allied fortress of Malta. On their way across the Atlantic the Melbourne Star came across an abandoned lifeboat which on closer inspection proved to be empty. It was a harbinger of things to come. By the 2nd of April the Melbourne Star was already northeast of Antigua and roughly half way between Bermuda and the Caribbean. She was 480 to the southeast of Bermuda and steering 220 degrees southwest at an impressive 17 knots. U-129 under Hans-Ludwig Witt was ecstatic to have found such a large target unescorted and in the wide expanses of the Atlantic, where counterattack from Allied aircraft would be rare and from Allied naval vessels nearly non-existent. On this voyage the ship was deeply laden with torpedoes, ammunition, silk, and general cargo including twelve airplanes in crates on deck. Captain Hall kept his men busy – the ship zig-zagged constantly, day and night. Also lookouts included two on the forecastle, three on the bridge and two on the aft gun. During the day one lookout supplemented the other seven aft of the bridge. These men had observed a ship hull-down on the horizon on the 30th of March and seen a Portuguese ship roughly three miles off on the first of April. The weather was fine when suddenly at 3:23 am local time two torpedoes slammed into the ship just behind the bridge. A few seconds later another penetrated the large ship forward of the bridge and amidships. The latter torpedo must have set off the ammunition, because three fourths of the ship were destroyed in a matter of seconds. 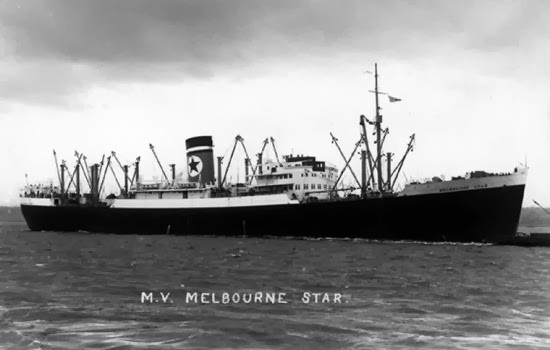 The forward portion of Melbourne Star sank in about one and a half minutes, and the stern remained floating for two to four minutes before it, too sank. Out of 119 persons, only 11 managed to float free of the ship and clamber on board two floating rafts. Though they heard other voices calling for help in the dark, at daylight these eleven divided up the space on the two life rafts. Four of them – Greaser William Best, Greaser William Burns, Ordinary Seaman Ronald Nunn and Able Seaman Leonard White – remained on the smaller raft, and seven on the other. Soon these small vessels, if one could call them that, were separated. The raft with seven men was never seen again. Witt and his crew lingered in the area until sunrise, then approached the raft. The German officer seemed perturbed to learn that no officers survived the wreck to speak to him. He asked the tonnage, departure and destination ports, and nature of the cargo. When Will learned that she was 12,000 tons he was elated, cheered, and yelled the good news up to his men on the conning tower. They in turn celebrated their substantial kill with loud “Heil Hitlers”. After getting what they wanted from the survivors – without asking after their well being – the submarine motored amongst the wreckage for some time, without picking anything up. Then it steamed eastwards a few hours after sunrise. Witt was described as being roughly 34 years of age, slim, and in good health. The crew were said to be tanned and wearing khaki shorts. An emblem on the conning tower appeared to be a crest with the word “Hamburg” written in ornate script below it. On board the only raft to survive the ordeal the men found eight tins of biscuits, other tins of chocolate, pemmican, malted milk tablets, and 22 gallons of water as well as two gallons of oil for massaging their skin (to protect them from sunburn). The biscuits, stamped 1942, were moldy and inedible and the water tasted oily. Though there was no fishing equipment provided, two weeks into the saga the men, who had been constipated until then, fashioned a hook out of one of the can openers. They made a spinner from part of a can and fishing line from some rope which they unraveled. As a result the men were able to catch over fifty fish, which cured them of their constipation and no doubt saved their lives and boosted their morale, not to mention gave then a positive activity on which to focus. They even saved and stored five or so fish on the raft at any given time. Altogether the four men survived for 38 days, until early on the afternoon of May 9th, 1943 when a US Catalina aircraft flying out of Bermuda spotted them and circled overhead for half an hour. The navy PBY aircraft was piloted by Lieutenant M. Kaufman and 1st Lieutenant Rex Knorr of the VP 63 Squadron, who saw the smoke and the men holding some sixteen hand flares. The men had lit a Roman Candle-style light to attract attention – the smoke bombs were wet. They were in position 28.34N and 61.31W, roughly 250 miles southeast of Bermuda. After surveying the situation Lt. Kaufman decided to land and rescue the men. Once the plane was on the sea surface a small boat was launched, and an officer rowed over to the survivors. Once the men were satisfactorily identified, the airplane joined the raft and the small boat. The four men who aside from skin ulcers were in surprisingly good shape then boarded the plane and it took off, arriving in Bermuda early in the evening of the same day.